With 160,000 attendees and 52,000 exhibitors, CES 2015 was once again bigger than ever. We spent 90 percent of our time meeting with our customers and partners, showing them our low-power, high-performance video coding and computer vision technology in our meeting room. Luckily, we had a few moments here and there to walk the show floor and see what else was going on. CES is big, and spread out over the city. On many days, we had already clocked 10,000 steps by half an hour after our breakfast meeting. That’s another thing CES is great for—meeting your fitness goals. Here’s an overview of what was going on at CES. The automotive industry’s presence is quickly growing. The car used to be 100 percent mechanics and combustion, but its electronic component has steadily been growing. The race toward autonomous driving is on. Google takes a revolutionary approach and focuses on fully automated driving, and Tesla’s Elon Musk said they’re five years away, but it was the German car makers who stole the show. Audi’s car drove itself from San Francisco to Las Vegas, then onto the stage. 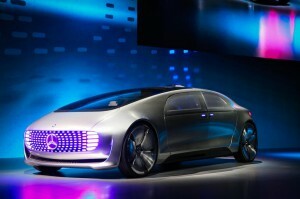 Mercedes unveiled its vision of the autonomous car, the Mercedes-Benz F 015 Luxury in Motion. And BMW showed off its remote valet parking assistant and smart headlights. On the semiconductor side, NVIDIA unveiled its latest SOC, the X1, which seems to have departed from the mobile and tablet space and is solely targeting automotive. At 10 Watts, thermal design issues will become a barrier to adopting this solution for anything besides the head unit. At our booth, we demonstrated our pedestrian detection, based on the histogram of oriented gradients algorithm and running at a few milliwatts. Also on display was our structure-from-motion implementation, developed together with our partner VISCODA. 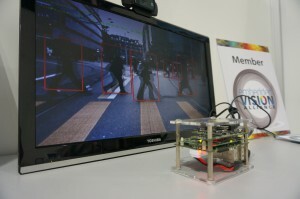 Structure from motion is a technique that captures 3D information using a standard camera. This 3D data can then be used for a wide variety of scenarios, including auto-parking and autonomous driving. In short, CES is quickly becoming a key automotive event, where automakers present new technologies and their vision for the future of driving. Last year, we were down the hall from Oculus, where they had a small meeting room. 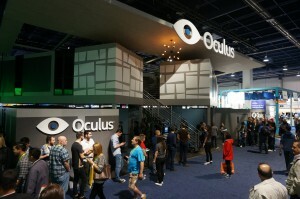 This year, we were again close to Oculus—but instead of a private meeting room, they had a huge open booth. Even bigger were the lines that wrapped all the way around the booth, whatever the time of day. Since Oculus is doing so well even though they’re not yet selling a consumer product, several companies were there with similar products. Virtual and augmented reality have been around for quite some time: since the 1960s, amazingly enough. Will 2015 finally be the year that these systems go mainstream? Every year at CES, the TV companies try to outdo themselves and leapfrog over each other. We’ve seen a progression from small to large displays, from SD to Full HD to 4K, from tube to plasma, LCD and OLED, from curved to flat to curved, and from dumb analog TVs to smart Internet-connected displays. Delivery used to go over the air; then it moved to cable and optical discs, and now the medium of choice is increasingly the Internet. But there is one constant factor that never changes: the consumer’s appetite for higher quality. Quality is all about resolution, frame rates, and color representation. 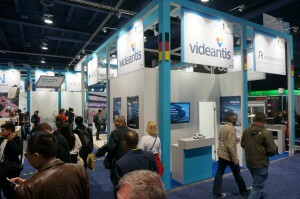 The videantis scalable processor architecture supports 4K, 60Hz, and 10/12-bit processing, so we’re in good shape there. This was the first year that drones were everywhere at CES. They were still confined to their booths, often behind nets, and we didn’t see any of them flying autonomously in the halls or outside yet. Still, the pace of innovation is high, and the possibilities are pretty endless. We humans can’t fly—but at least we can make our electronics fly, right? Many drones carried cameras and image sensors: to take pictures from the air, as well as to navigate, to follow objects, and to avoid obstacles. Though I saw a lot at CES, I’ve probably missed quite a few areas. With 20,000 product announcements, it’s hard to see everything. One thing is clear, though: this year’s edition also held many key product announcements focusing on novel ways to use displays—and especially cameras and image sensors. And that’s exactly the space we address with our unified video/vision processor IP and high-performance software. We’re already looking forward to CES 2016.